Second week of my cold and I can't say I'm feeling any better at all. My annoying dry cough is giving me major rib pain, but on the upside is driving my husband nuts which is payback for his snoring lately due to his hayfever which is driving me nuts! And I got to take another week off work, so there's always a silver lining to almost any situation. I'm very pleased with how it turned out. It fits nicely now, but still has enough room and stretch for me to grow into it for the next few months at least. 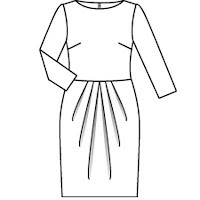 And it was so simple to modify for a maternity version: I simply raised the waistline seam to an empire line, made the front skirt piece wider by 10cm and made each of those pleats a little deeper. I had previously modified the back pattern piece from a single dress panel to a skirt and bodice, so I raised the waistline seam on the back to an empire waist as well to match the front. I even remembered to make the dress longer at the front so the hem line dips down right now, but with a bit more growth in the belly area it will even out. When I made the fuchsia version of this dress, I lined the bodice which enclosed the underside of the cap sleeve nicely. I chose not to line this dress because I want to be able to wear it during summer but I was also too lazy to draft some armhole facings, so all I did was turn under the edge and top stitch it down. It's hardly noticeable, and I really doubt anyone will be staring at my underarms! The only thing annoying me is the front neckline is gaping open, which is not something I experienced in the two previous versions I made. I don't know if it's because this is a stretchy knit and not a woven, or because I didn't interface the neckline, or possibly even a combination of both. Looking at the photo of the Burda model I see her dress slightly gaping at the centre front too, so maybe we're both hunchers with our shoulders slouched forward! But I don't plan to undo it to fix it though, it's just something I'll live with. And now if you'll excuse me, I'm off to once again consume my body weight in vitamin C and annoy my husband some more with my coughing! This looks fabulous, a beautiful maternity dress. You scored this one, little Momma! The dress and you looks great, awesome maternity dress. I like the dress alot and thought that you left room in the bodice area for extra growth there. I always love how you take regular patterns and maternity-ize them! Great maternity dress. Of course I love the color, grey my favorite. Hope you shake that cold soon. The dress is beautiful. It even made me sigh for a baby for at least a second before I remembered that I am happy with my two beautiful children. Hope you are feeling better soon, and enjoy your pregnancy. OH SO CUTE! this dress makes me wanna get preggers again so I can wear it too! or maybe I'll just admire you in it. two littles are enough! Awesome dress on you (all three versions!) You look so beautiful - love the baby bump!!!! Gasp! SO pretty! What a great job you did on modifying it for maternity wear. Oh squeeeee!!! I'm supposed to be making a maternity dress but I live in fear of screwing it up! The dress I'm doing is very similar in shape so now I feel better about pressing on. Hey, I must have missed the post with the fabrics? I can't seem to find it. I suppose if you really want to do something to make it gap less... if you want you can take a little bit of thread and on the inside of the bodice front... you can hand stitch the under-facing to tighten it up a tad bit. I ended up having to do that with the last dress I made for my friend Lois... she is a little gal like you and it worked very nicely! You and pregnancy look very good together! 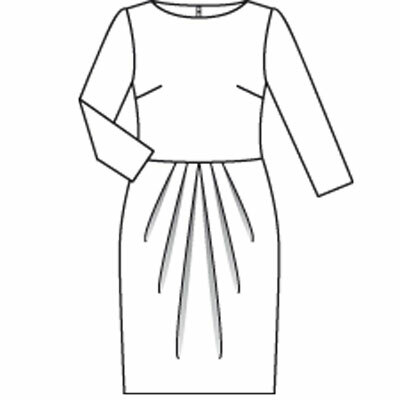 This is a gorgeous dress - and such a helpful explanation about how you adjusted the pattern. I hope you get rid of your cough soon - although a week off work is almost worth it! This is very cute dress and very work-appropriate at the same time, which is almost impossible to do at the same time! I think you look beautiful! You did such a great job! Beautiful maternified version! I really love this. I love all your versions of the dress. The maternity version is particularly clever. Hope that you can adjust it to wear again post-bub. You look very well. Wow! That looks great. I am pregnant too and trying to get nice, normal and trendy-looking maternity patterns to sew with is quite the challenge! I don't want to end up looking mumu-ish, but a lot of patterns are not great. I love how you modified this dress! Congrats on your pregnancy! Somehow I missed that announcement, but you look great!! You did such an amazing job converting this to a maternity dress. It is so chic. Love your maternity version of this dress on you. It looks so beautiful! Hope you can wear it a lot during your pregnancy. I love this dress. Do you think it could be made out of lace with the body lined and the sleeves left unlined?